Everglades National Park is the largest subtropical wilderness in the country. The park is home to several rare and endangered species. It is also the third largest national park in the lower 48 states, after Death Valley and Yellowstone. Each year, more than one million people visit the Everglades. The Everglades is considered one of the great biological wonders of the world. The expansive wetlands stretch across more than 600,000 hectares. It is a place where plants and animals from the Caribbean Sea share an ecosystem with native North American species. Nine different environments exist within the Everglades. 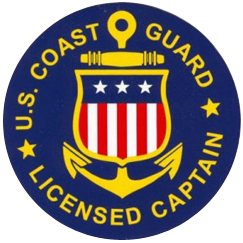 They include mangrove and cypress swamps, estuaries and coastal marshes. The Everglades is home to about 15 species that federal officials say are threatened and endangered. They include the Florida panther, the American crocodile, and the West Indian manatee. In addition, more than 350 bird species and 300 species of fresh and saltwater fish live within the park. 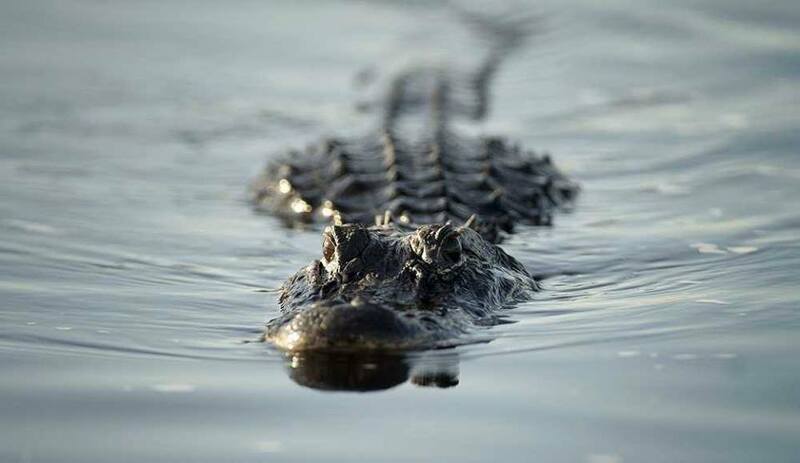 The Everglades is also home to 40 species of mammals and 50 reptile species. Visitors to the Everglades will see many exotic plants. They include what is said to be the largest growth of mangrove trees in the western world. Gumbo-limbo trees, known for their peeling red skin, strangler figs and royal palms are also among the area’s plant life. The country’s largest living mahogany tree also lives in the Everglades. Sawgrass grows in some areas of the park. Be careful – sawgrass is very sharp, with teeth just like a saw. It can grow up to four meters tall. With about one and one-half meters of rainfall each year, plants and trees never stop growing in the Everglades. The dry, winter season is the favorite of most visitors, when insects like mosquitoes are less of a problem. The rainy season lasts from June to November. There are many ways to explore the Everglades. 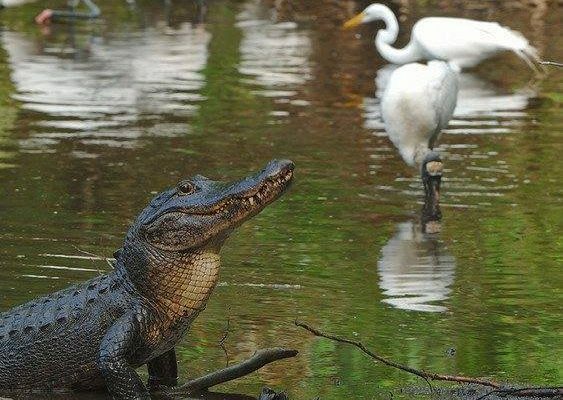 Visitors can see alligators while hiking the Anhinga Trail. 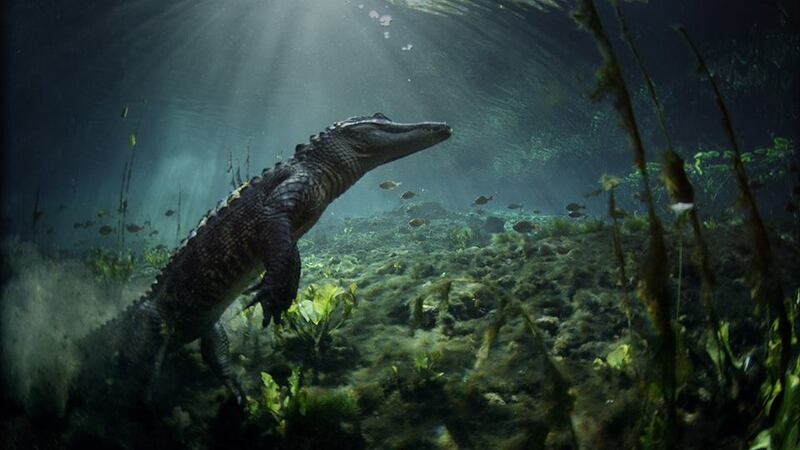 The Everglades is one of the only places on Earth where freshwater alligators and saltwater crocodiles live in the same area. Visitors using canoes or airboats are likely to see large groups of wading birds like the wood stork or the great blue heron. It is even possible to see flamingos in the Everglades. Some visitors might enjoy riding bicycles through Shark Valley. Others may want to move slowly through shallow waters where they can see insects and wildlife up-close. Park guides also lead visitors on tram rides. Today, some of South Florida’s early wetland areas no longer exist. Populations of wading birds have been reduced by 90 percent. Whole populations of animals are in danger of disappearing. The endangered creatures include the manatee, the Miami blackhead snake, the wood stork and the Florida panther. In recent years, environmental experts have learned about the damage to the Everglades. Some experts say the balance of nature there has been destroyed. 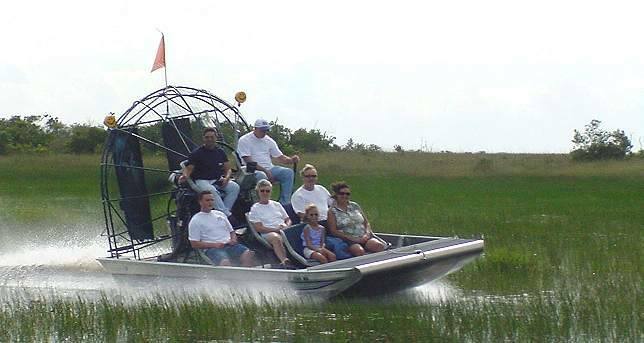 Airboat rides in Everglades is one of the most sought-after adventure that tourists look forward to. Tourist book their Airboat tours in advance to enjoy their vacation during their stay. We at ride-the-wind keeps no stone unturned to provide the best Everglades airboat tour so that every tourist can cherish this thrilling adventure throughout their lifetime. 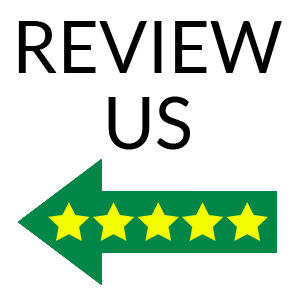 We make sure that all the safety measures are followed during each airboat ride so that the tourists can enjoy their best everglades airboat tours without worrying about getting hurt. Book your private Airboat ride with us and enjoy the life to the fullest!